Villwroy & Boch - Timeless elegance, innovative design and extraordinary quality since 1748 for bathroom and wellness, tableware and tiling. For more than 260 years discerning diners have been laying their tables with the finest porcelain and glass. Translating its centuries of expertise into a timeless tableware the family-own brand crafts each piece with a touch of class, turning any meal into an occasion. Iron master Francois Boch and his three sons set up a pottery school in 1748, and soon followed with their own ceramics kilnworks where they operated a porcelain factory. Among its innovations in Mettlach at the end of the nineteenth century was Phanolith, a kind of semi-transparent porcelain that combines the characteristics and benefits of jasperware and pate-sur-pate. Merging with local businessman Noclas Villeroy in 1836 resulted in the innovative company we know today. Famed for the Anmut's collection's clean lines and the modern unconventionality of New Wave Tableware, turn to Villerpy & Boch for the watercolour florals of the Marie Fleur pattern or plump for the rustic Artesano Provencal, with each carefully designed collection promising individual style for the home. 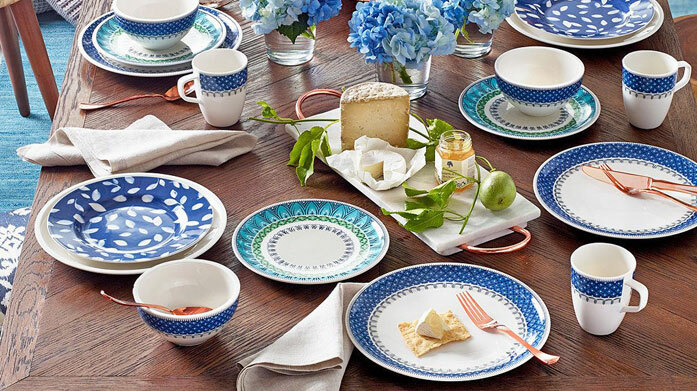 Update your tableware collection with Villeroy & Bosh, from crockery to cutlery, to glassware and cookware, Brandalley have it all, for much, much less!